Call a method to perform some action on a Google Map. Actions that you can perform include: Clearing markers, opening or closing an info box, adding a marker to the map, centering the map on an address, setting the map zoom factor. In many cases where a Map is used in a UX that has Panels, you will set the 'Fill container' property on the Map and so the map will resize automatically. You will not need this new action. Add KML Layers to a map - Allows you to add a KML layer to your map. Get a pointer to the Google Map object - Allows you to get a pointer to the underlying Google Maps object. Useful if you are trying to implement some code you found while reading the Google Maps API documentation. Get distance and travel time between two points - Computes the distance and travel time between destinations in an array of two or more locations. Specify the map you want to operate on. The List control in the UX component that contains the locations to add to the map. The specified List control must have a "latitude" and "longitude" field that contains the location to add to the map. Specify the name of the Data Series that contains the data for the markers. To define Data Series, go to the Properties Pane. Specify the Group Names of any marker groups you want to clear from the map before adding new markers. Each marker is given a unique name based on the marker name prefix and the row number in the Data Series. Specify the group name that each marker belongs to. If you want to include data from the Data Series in the name, use a template. Click the smart field button to define the template. If you leave this blank a default icon will be used for all markers. You can customize the icon used for each marker on the map. For example, you can dynamically set the icon based on an expression, an Xbasic function, or an 'icon sequence'. Specify the marker title. If you want to include data from the Data Series in the title, use a template. Click the smart field button to define the template. Specify if each marker has a detail view. Specify '<true>', '<false>' or the name of a Data Series column that has a logical value. Specify if each marker is draggable. Specify '<true>', '<false>' or the name of a Data Series column that has a logical value. Specify if each marker should be animated when placed on the map. Specify '<false>', '<drop>' or '<bounce>', or the name of a Data Series column that has 'drop', 'bounce' or 'false' as a value. If the maker animation is set to 'drop' specify the length of the animation in milliseconds. You can select a Data Series column that has a duration value. Specify if a circle should be drawn around each marker. Select <true>, <false> or the name of a Data Series column that returns a logical value. Specify the overlay size either by specifying a radius or area. Enter a number with the following suffix: "m", "km", "mi", or "ft" for radius, and "sq m", "sq km", "sq mi", "sq ft" for area. Alternatively, select a Data Series column that contains the overlay size. Specify the overlay color. Alternatively, select a Data Series column that contains the overlay color. Specify the overlay fill opacity (a value between 0 and 1 - solid color). Alternatively, select a Data Series column that contains the overlay fill opacity. Specify the stroke color (color of the line surrounding the circle). Alternatively, select a Data Series column that contains the stroke color. Specify the stroke opacity (a value between 0 and 1 - solid color). Alternatively, select a Data Series column that contains the stroke opacity. Specify the stroke width (in points). Alternatively, select a Data Series column that contains the stroke width. 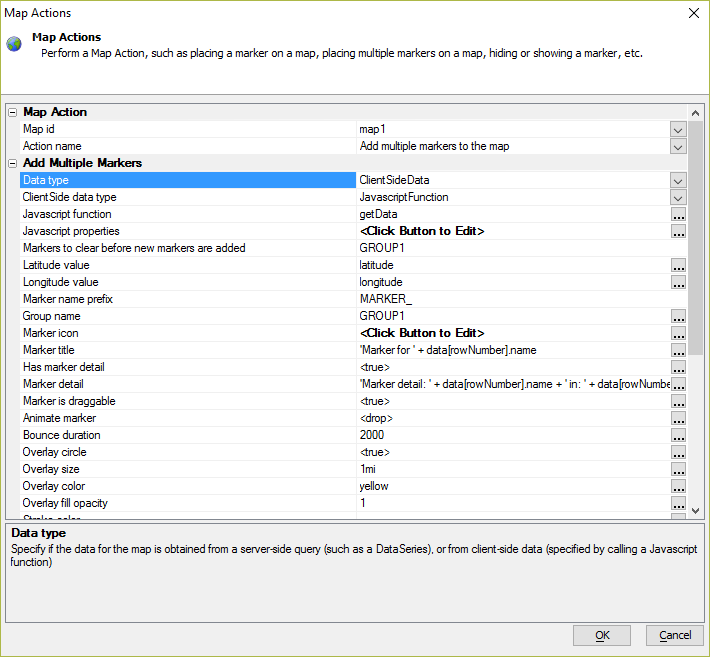 For more information, watch "Adding Multiple Markers to a Map Control using Client-side Data" in the Videos below. Remove a specific marker or a group of markers. Choices include Marker, Group. Specify if you want to emphasize or de-emphasize a markers. Choices include Emphasize, De-Emphasize. How do you want to specify the markers to emphasize/de-emphasize? You can either specify by marker name or marker group. Choices include By Name, By Group. Enter a comma delimited list of marker names. Enter a comma delimited list of marker group names. Indicate if the map should be panned into view. If true, the device will use its most accurate method to get location information. If false, the device will use its fastest or lower power consumption method depending on the device. The amount of time in milliseconds to wait on the device to acquire location information excluding the amount of time it takes the user to grant the web page access to geolocation data. The amount of time in milliseconds to accept a previously acquired location. 0 means that a new location must be acquired from the device. Specify the marker location. You can either enter an address, or a lat/lng value (as a comma delimited value e.g. 34,-118) . Specify the name of the control to read for the latitude value. Specify the name of the control to read for the longitude value. Specify the name of the control(s) to read. The control(s) can either contain an address or a lat/lng value (as a comma delimited value e.g. 34,-118). Specify the List column(s) to read. The list column(s) can either contain lat/lng values or an address. Specify the name of the column in the List that has the latitude value. Specify the name of the column in the List that has the longitude value. Specify if the value for the marker position is an address, or a latitude/longitude value. Choices include Address, Latitude/Longitude. Specify if the marker should be shown or hidden Choices include Show, Hide. Specify if the map should be scrolled to bring the marker into view after it has been added to the map. Plot a route between two locations: a start address and end address. The end address for the route. See Start address for how to specify the address. If enabled, locations in the route can be moved by dragging them on the map. The travel mode to use. Can be "Driving", "Walking", or "Bicycling". The distance units to use. Can be "Default", "Imperial", or "Metric". If checked, highways will be avoided when the route is generated. If checked, toll booths and toll roads will be avoided when the route is generated. The distance units to use. Options include Default, Imperial, and Metric. In this video, we show how you can add a marker to a map. In this video, we show how you can add bulk markers to a map. When the user selects a state from a dropdown box, we show how to put a marker on the map for each airport in the selected state. In the case of server-side data you specify the name of a Data Series that specifies the properties for each marker. A common requirement in mapping applications is to compute a route (showing driving directions, distance and travel time) between points.